Friday August 16 1907 I got my dinner going all right this morning. I had Callie, [Orna? Osme? ], Mollie & Lib, Minnie, Hattie & Fannie Ott & William here for dinner. We had a good visit and my dinner was nice. They went home about five oclock. I got supper over and we talked in evening I had a card from Lizzie she is in Minneapolis. Saturday August 17 1907 I was busy with my baking and the dinner till noon. Lorna went down at 12.37 to see Dr Smith I did up the work and went at 2.37. Was at Fannies a little while and up home where Lorna and I stayed till after supper. Got some things up town coming home at 8.20. We visited till nearly ten oclock. 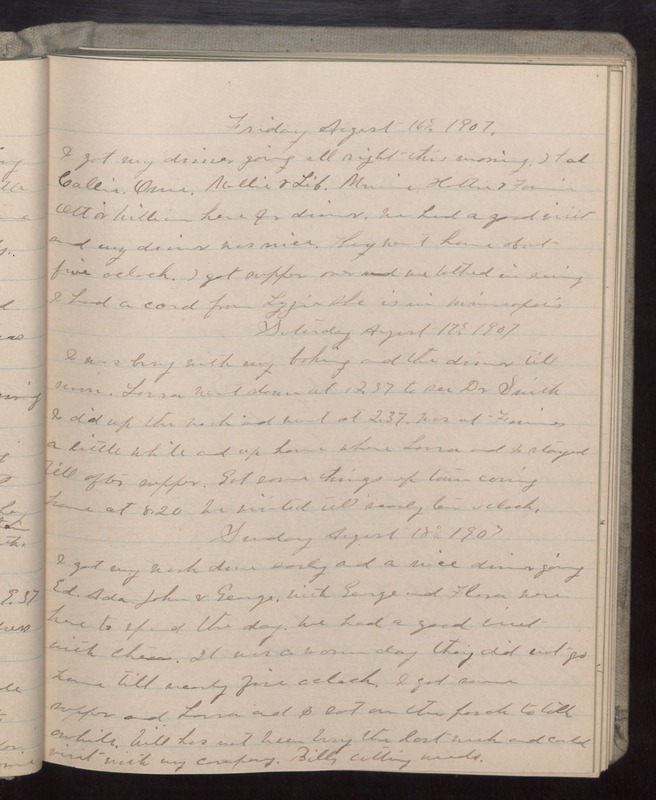 Sunday August 18 1907 I got my work done early and a nice dinner going Ed, Ada, John & George with George and Flora were here to spend the day. We had a good visit with them. It was a warm day they did not go home till nearly five oclock. I got some supper and Lorna and I sat on the porch to talk awhile. Will has not been busy the last week and could visit with my company. Billy cutting weeds.